PREPARING THE WAY for the track. 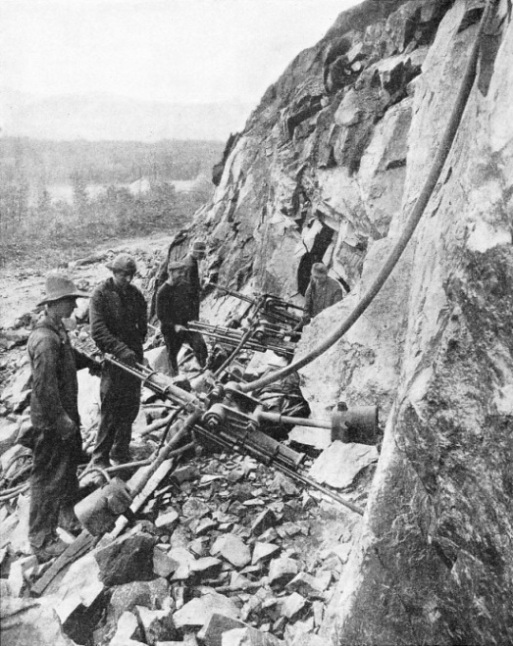 Three tripod-mounted heavy drifter drills in action on a cutting near Barnet, in Vermont, USA The dimensions of the bore of the drills vary from 2⅝-in to 4 in. Two men are generally needed to operate one of these powerful machines. IN the chapter beginning on page 458 we saw the “heavy artillery” of the engineer in action. An equally important part is played by the “machine guns” of the engineer. Excavations for a railway, whether they involve boring through mountains and hills, or making cuttings in the open, are easily made when the medium encountered is soft ground. Even hard clay, shale, ground full of stones, boulders and soft rock are successfully overcome by the “big guns” or mechanical diggers, which dispose of them in vast quantities. When hard solid rock is met, as so often happens, the “big guns” have to retire and the “machine-guns” are brought up for action. By the “machine-guns” are meant the various types and sizes of rock drilling and boring machines. 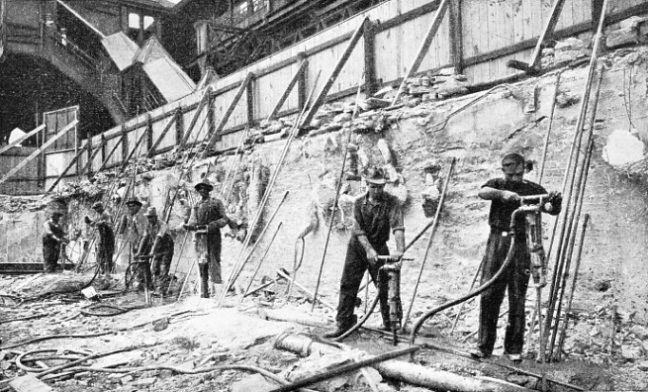 At first rock drills were worked by hand, wind, or steam, but attempts were made in 1850 to use compressed air as a driving power. In 1855 two compressed air drills made their appearance, and met with a measure of success. These drills were forerunners of the modern hammer drill, the compressed air being used to give a rapid succession of blows on the end of the borer. Compared with the modern rock drills these old machines were very primitive affairs, but they marked a distinct advance on the older types. Their success when used on underground work made it evident that machine drilling by means of compressed air was a workable proposition, and could be effectively carried out. Thus, the compressed air drill began its career in rock tunnelling. The work of the earlier machines was more expensive than hand drilling, For instance, when the Mount Cenis Tunnel between France and Italy was being built the cost of machine drilling was double that of hand drilling, but the rate of progress was trebled. 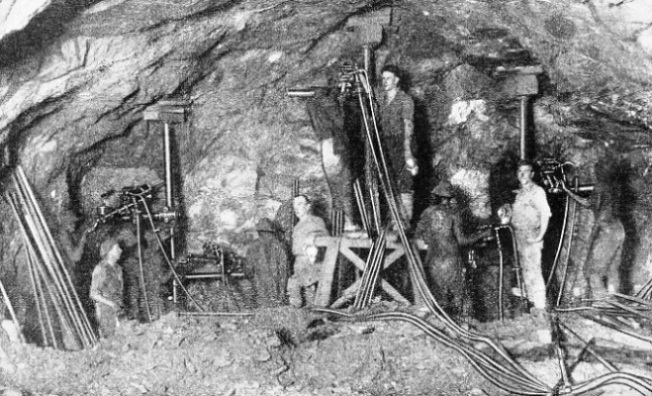 The rock drill was first employed for tunnel construction in America in the Hoosac Tunnel, where the “Burleigh” drills were brought into operation. These machines were so heavy, and the expense of repairs was so great, that they could not have been used at all without government assistance. Hand-power drilling was first used in England in the Clifton Tunnel, on the Clifton Extension Railway, in 1874. 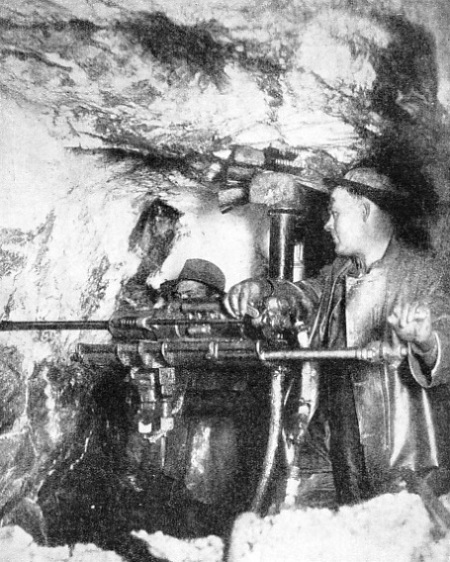 The tunnel was driven through mountain limestone, and an old-fashioned machine known as the “Beaumont Diamond Rock Drill” was brought into action after the work had already been in progress for some time. This machine was worked by compressed air, and immediately it began to operate the rate of progress was three and a half times that done of hand labour. Here, again, the cost of the work done by the power drill was higher than that of hand labour, but the speed obtained by its use more than compensated for this. It soon became evident that a rock drill, to be successful, had to be simply made, light yet strong in every part, and provided with as few moving parts as mechanically possible. After the completion of the Hoosac Tunnel, in America, a much lighter and simpler drill appeared. This machine, known as the “Ingersoll”, was used on some forty-two of the fifty important tunnels which have been driven in America since the Hoosac Tunnel was built. The most noteworthy of these tunnels was not a railway tunnel, but the New York Aqueduct Tunnel, which was thirty miles long, and was bored in about two years - a remarkable feat of engineering. Shafts were sunk about one mile apart along the line, and the tunnel bored from shaft to shaft, over the whole thirty miles. The record speed for driving, obtained when twenty-three miles of tunnel had been driven, was an advance of over 48½ ft in one week. Until the early part of the 20th century the boring of holes was done “dry”. It was, however, found that it took a much longer time to bore dry holes by what is known as the reciprocity type of rock drills than when water was employed. The former dry drilling machines took from three to six times as long to drill a flat or horizontal hole, six to seven feet deep, as would be taken to drill a water hole of the same dimensions. This was due to the fact that dry holes required constant cleaning alter about three feet in depth had been drilled. The dry particles in the hole did not allow the drill bit free impact against the bottom of the hole. Thus the dust formed a cushion that prevented the drill bit from striking the clean rock, and retarded progress. In a water hole, where the cut particles of rock were well moistened, and converted into soft liquid mud, the drill bit, when plunged into the bottom of the hole, was able to pump out these particles. Thus, a more or less clean face was presented to the bit. An endeavour had to be made to overcome the main difficulties, which were lack of power, slow boring, and the necessity for using large and unwieldy machines to overcome the friction caused by the particles of rock which remained in the hole. The object was to produce a smaller and lighter machine which would work in a clean hole free from particles, and which had a hollow bit through which water and air could be passed to the cutting edge of the drill bit. This was done. When holes had to be driven upwards, however, it was found that they could be bored dry much more quickly than when bored wet, as long as the cut particles and dust were ejected from the hole after each stroke of the drill. For this reason the introduction of water was abandoned. Air was, therefore, introduced through the hollow drill bit to the end of the hole at each backward stroke of the machine, thus blowing out the cut rock and dust and allowing the drill a clean face to strike upon. The next difficulty was the question of dust, which had still to be considered from the point of view of the men operating these drills. To overcome this a form of water spray was introduced which automatically discharged water round the surface of the hole being drilled. This water was in the form of a very fine spray, about 15-in diameter, meeting the dust and particles of rock as they were discharged from the hole, and at once turning them into mud. Various methods of employing this clever contrivance have been devised. Rock drills are now of two distinct types: (1) Reciprocating drills, (2) hammer drills. The latter are divided into (a) hand-held drills, (b) cradle-mounted “drifter” drills, and (c) “stopping” drills. The reciprocating drill has the steel or bit made fast to the piston, whereas in the hammer drill the piston and bit are independent of each other, the steel being held loosely in what is known as the chuck. Whilst the reciprocating type is still used, it is considered that its great weight and slow drilling for the amount of air consumed makes it uneconomical. Another disadvantage is its inability to remove the cuttings from the hole except by the use of a “swab” stick, or blow pipe. Further, the only means of introducing water into the hole for allaying dust is to pour it in by hand, which is a slow, laborious process. When compared with drills of the hammer variety the number of blows per minute is small. The drills of the hammer type, known as jackhammers, are universally used either as hand drills, or mounted on a cradle. The smaller machines weigh 40 to 50 lb. The big machines, known as “drifters”, vary much in size, according to the ground in which they have to work. The dimensions vary from 2⅝-in bore to 4-in bore. When working with heavy “drifters” mounted on cradles, two men are needed to work a machine. One is known as the drill runner, and the other as the spanner man. These two men always work together and, because of the noise produced by the drill, communicate with each other by means of signs. A complete understanding between the two makes for speed. It has been found that the time taken for drilling sixteen holes by two men who had not worked together before, decreased from four and a half hours on the first day to three and a half hours on the second, and to three hours on the third day. This work was done on fairly hard rock. The light machines are used in smaller soft rock tunnels, and the larger “drifter” machines in driving large tunnels in hard rock. All the “drifter” machines, when used in tunnelling, are equipped with water injection for the prevention of dust and the removal of cuttings from the hole. In Great Britain, so far, the authorities are satisfied with the squirting of water down the hollow drill steel to lay the dust, but in South Africa the Department of Mines will not pass any drill unless equipped with what is known as a ventilating cover. The light “drifter” type of drill, 3-in and 3½-in diameter, is mostly used for shaft sinking where the drilling speed is very high. When used for this purpose, such drills are removed from the cradle and mounted on spring handles; they weigh 85 to 110 lb each. “Stoping” machines are, to all intents, jackhammers mounted on a column which keeps the drill up to its work. The modern jackhammers and “drifter” drills can deliver 1,500 to 2,000 blows per minute, While the old reciprocating type delivers only 300 to 400 blows per minute. 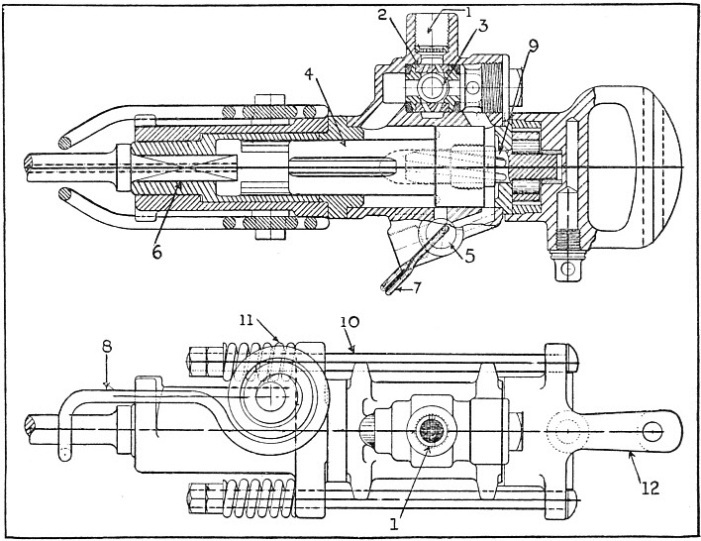 A modern type of hand hammer drill, illustrated in the diagrams shown right, is operated as follows: compressed air at 70 to 80 lb pressure is conveyed to the machine through a rubber hose and an air connexion to the opening at (1). The air enters the machine and passes through the holes in the valve cage (2), past the valve (3) into the top or right-hand end of the cylinder. It pushes the piston (4) forward until the point of the piston hits the end of the hollow drill steel. At the moment when the piston strikes the drill steel, the head of the piston passes the exhaust port (5) and allows the air to escape; at the same time, this drop of pressure in the cylinder causes valve (3) to move over to its opposite seat, and air is admitted to the left side of the cylinder for the return stroke of the piston. On the power stroke from right to left, when the piston is hitting the drill steel (6), no rotation of the drill takes place, but on the return stroke the drill steel is rotated. When it is desired to blow out the hole, the choke valve (5) is closed by the blow-out handle (7). This shuts the exhaust and sends a blast of air down the splines or grooves of the piston, through the hollow drill steel, to the cutting bit. The hollow drill steel has, at the end opposite to that which enters the machine, a suitable cutting bit usually of the cross type which chips the rock each time the piston hits the shank end of the drill. The spring (8) is a retainer to keep the steel in place when extracting from the hole drilled. When wet drilling is desired, the machine is fitted with a water tube which passes through the rifle bar (9) and piston (4) into the hollow drill steel to convey water to the bottom of the hole. The lower diagram shows the drill in elevation; (10) being the side rods, (11) the side springs, (1) the air inlet, and (12) the handle by which the machine is held. As gunpowder in one form or another is the power behind the machine-gun, so compressed air is the power behind the rock drill of today, and it will be interesting to see how this is produced. At first, air-compressing machines were all of a stationary type, and where a large quantity of compressed air was required for a large tunnel, the compressed air was supplied from a power house in which several large compressors were installed. DIESEL DRIVEN. A portable air compressor for supplying power to mechanical drills. This compressor is water-cooled. Air for hand hammer drills is supplied at 70 to 80 lbs pressure. History does not tell us who brought out the first portable air compressor. The first attempt probably consisted of taking an old-fashioned standard slow-running machine from place to place on a timber raft placed on wooden skids. The machines were, of course, run by a steam engine; and were known as “portables”. They were popular up till the end of 19th century. 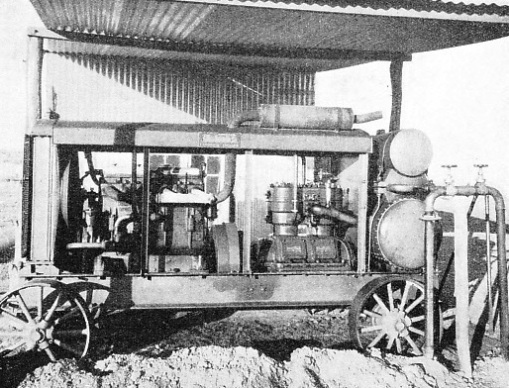 About forty-five years ago the first horizontal steam-driven compressor came into being, and was used for semi-portable work. In this machine the air cylinder was mounted in front of the steam cylinder, and there was a piston rod which was common to both. A portable boiler was used for the steam power, and was moved from place to place with the compressor. These machines, with improvements of course, are used to-day, and they still prove quite suitable in certain conditions of work. The advent of the internal combustion engine was at once seized upon by manufacturers of compressors, who applied it, as a driving power, instead of steam. Considerable difficulties, however, had to be overcome before the working of petrol-driven compressors was perfected. Early in this century the most common type of portable compressor was a two-cylinder vertical petrol engine which drove, by means of a belt, what is known as a horizontal double-acting single-stage Hooper-cooled compressor. When the air was compressed it was passed into a tank, or air receiver, which was placed alongside the compressor. All this, mounted on a heavy steel framework supported on axles and steel wheels, was about four times the weight of a modern machine of the same capacity, and occupied much more space. 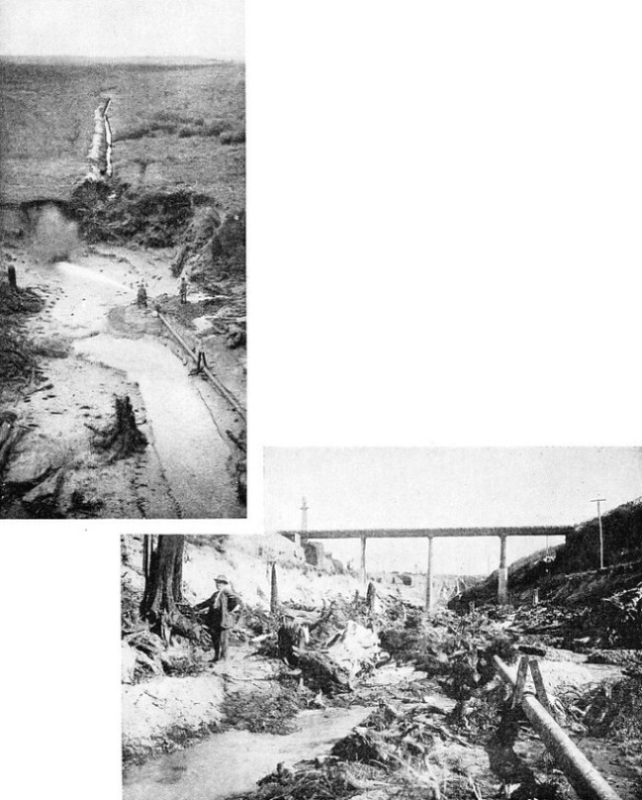 CLEANING UP the spoil, after a blast of explosive has loosened and broken the rock is accomplished by means of a drag-line and mechanical excavator as seen in the accompanying diagrams. The pictures show how the scoop of the drag-line drags the broken rock on to the elevator, which transfers it to the truck beneath. The small diagram illustrates how the shackle is secured to a chain across the working face of the tunnel. Since the early years of this century very rapid improvement has taken place in air compressors. We now have the crude-oil Diesel-driven machine, which has only comparatively recently come into use, and up to the present is the last word in portable air compressors. When the drills have done their work in the tunnel, and the rock has been blasted, a large portion of the operation still remains to be done; that is, the cleaning away of all the broken rock and material blasted down. In earlier days this was done by man power. The men loaded the spoil into trucks by hand, and laboriously pushed the trucks along the tunnel to its mouth, or to a shaft. Loading limits the speed of advance in a tunnel of usual dimensions, and it is not possible to employ more than a certain number of men; otherwise they would get into one another’s way. It was, therefore, found necessary to devise some mechanical means of speeding up loading. The modern machine for this purpose is known as the scraper loader. One of the chief essentials for driving a tunnel at a rate that is both fast and economical is an effective loading device. In no other form of excavation is it so necessary that the link between breaking the rock and transporting it should be really efficient. A type of scraper loader consists of an incline or ramp running up to a horizontal platform, or jib, all set in a very strong steel frame. The driving power may be either compressed air or electricity. The driving winch has two drums, one for pulling the scraper bucket from the machine to the face, and the other for pulling back the loaded bucket to the machine. There is a large open space on the horizontal platform of the machine, so that when the truck is run in under the platform the scraper bucket can discharge its contents into it, when the bucket is pulled up to the top of the ramp. The operations are as follows: On arrival at the working face of the tunnel after a blast or, rather, at a point thirty or forty feet from the face, the apron is lowered and secured to the rails by clamps, and the electric or air motor is connected ready for use. While the above has been going on, preparations have been carried out for anchoring the tail sheaves, or blocks. Several holes are drilled at intervals across the face about two or three feet above the top of the pile of broken rock. Into these holes plugs and feathers are inserted; or, as an alternative, one hole may be drilled on either side of the face and plugs inserted, when a chain is slung between them. A special shackle link is used with the chain, and the sheave is hung on this link. These sheaves are to allow the bucket to get at the whole pile of dislodged material. The sheave through which the tail rope is threaded is first of all hung from the centre plug, and scraping is begun. When the material along this line has all been scraped and loaded, the sheave is moved to another position, and so along from one point to another until the whole face is cleared. In tunnel work, electric battery locomotives are used to transport the rock in trains of trucks to the tunnel mouth, and so to the dumping point, or, where a tunnel runs between shafts, to the cage which takes up full trucks and brings down empty ones. A DRIFTER DRILL mounted on a column bar boring into solid rock 1,000 ft below ground at the coniaurum mines, Schumacher, Ontario. Another form of “machine-gun” used by engineers is the sluicing pump or “monitor”; its action is known as sluicing or hydraulicking. This machine is useful only for excavating earth, sand or gravel. To carry out excavations by sluicing it is necessary to install a powerful pump, or pumps, near a river or other plentiful supply of water. From the pump a pipe of fairly large dimensions - say, 15-in diameter - is led to the point at which it is required to start sluicing. At this point the “monitor” is placed, and the delivery pipe connected up to it. The “monitor” has a long barrel, gradually reduced from the diameter of the supply pipe to about 3½-in diameter at its nozzle. The reduction in the size of the pipe from 15-in to 3½-in gives a tremendous pressure which is at least 100 lb to the square inch when it leaves the nozzle. The “monitor” is placed on a suitable bed and securely anchored down to it. It is so constructed that it can be swivelled round to act in any direction. The powerful jet of water is now directed on to the face to be excavated, and it is a wonderful sight to see the material crumble away under the great water pressure. An interesting example of sluicing is provided in New Zealand. Before work was started the ground looked perfectly normal, but when the water began to bite into the ground a buried forest became exposed. The trees were all broken off at different levels, and all showed signs of having been charred by fire. This is accounted for by volcanic action. An eruption had evidently taken place at some distant period, when red-hot cinders had fallen on the trees, setting them on fire and gradually burying the stumps completely. It will be apparent to anyone how difficult it would have been to excavate ground in a tangle of stumps and roots. The procedure in this instance was as follows: Water was raised from a large river by means of a powerful pump and sent along a line of pipe to the “monitor”. A channel was excavated from the face to be attacked, falling right back to the river. When the ground was washed down by the water jet it gradually found its way into the channel, and was washed back into the river by the great volume of water falling from the face. The river, being deep and rapid, carried away all the material so washed down. When the face got too far away from the “monitor”, the pipes were lengthened and it was moved forward. The stumps and roots were easily pulled out by horses. The channel to the river had, of course, to be kept clear of silt, and a few men were constantly kept on this work ; but the flow of water itself was sufficient to carry away the silt and keep the channel fairly clear. Modern railway construction demands, above all, speed. When a new line is planned the first question to which the company requires an answer after the surveyor's report has been drawn up is exactly how long the projected enterprise will take. The slogan that time is money holds good to-day more than it ever did. Engineering equipment is yearly improving, and the new types of drills, more efficient and easier to handle, are the outcome of experience combined with repeated experiment. Tunnelling through hard rock is now relatively a simple matter compared with the arduous task it was a few years ago. A BATTERY OF DRILLS photographed in action on the face of a tunnel at Randfontein, South Africa. In the right foreground are the pipes bringing the compressed air to the drills. Spare drills can be seen standing ready. You can read more on “The Track’s Heavy Artillery” on this website. WATER POWER. In some territories spoil is excavated by means of sluicing “monitors” which project jets of water at high pressure and wash away the ground. Pressure of water leaving the sluicing machine can be as much as 100 lb per square inch, which is brought about by the gradual reduction of the supply pipe. The photograph on the left shows a “monitor” in action, while the one below is a remarkable view of an ancient buried forest in New Zealand revealed by sluicing operations.